To build upon our last update on the state of WildStar, we wanted to share some more details on what exactly you can expect from our next big content update. I know you’ve all been waiting for this one, and probably wondering what we’re putting in it after all this time. Well the short answer is, more than we’ve put into any update so far. 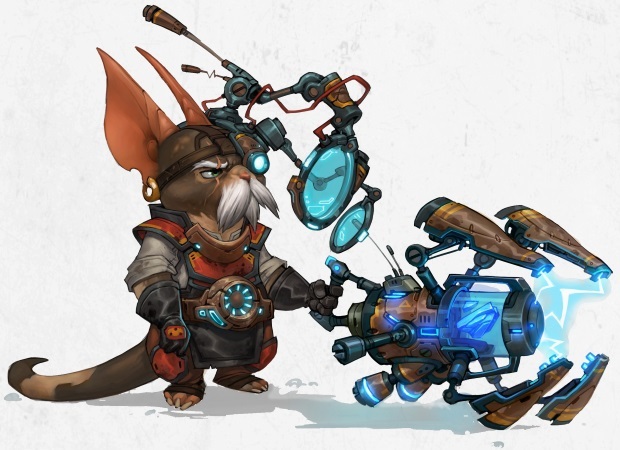 WildStar is a big game, and it’s about to get bigger. With our next content update, you’ll be exploring the next two chapters of content, “Mystery of the Genesis Prime” and “Journey to OMNIcore-1”. “Mystery” introduces a new zone for level 50 players, The Defile. Battling against The Strain, you’ll finally discover the secrets of Drusera, The Entity, the Eldan and how they’re all related to Planet Nexus, secrets that you’ve been slowly uncovering from the start of WildStar. But don’t pat yourself on the back too soon, that mystery you’ve just solved opens up an even more epic story as Journey to OMNICore-1 introduces you into the galaxy-spanning Nexus Saga. We’ve added content for players of all stripes, from lore-filled immersive solo content, to fast and furious 5-player quests and massive 20-player public events. As you make your way through these new zones, you’re going to unearth a lot of lore through the form of new datacubes, quests, collectibles and places to discover. You’ll put some old secrets to rest and discover new mysteries along the way. Best of all, you’ll be experiencing this new lore in an entirely new fashion. Starting with Journey to OMNICore-1, NPCs will be fully voiced, making the story easier to digest and more immersive. Our top-notch cinematics team has been hard at work providing even more great video content in this update, making the story come alive with some of our best cinematic scenes to date. And you’ll have multiple ways to experience the story, with branching paths and choices along the way that yield different loot, datacubes and information depending on what paths you take. You’ll want to play through this update multiple times (did we mention it’s repeatable) to experience all there is to see. And of course, new loot for all the hoarders out there. Our fans matter most, and the devs at Carbine are always listening. We’ve heard you and made some key improvements in areas you’ve requested. With this new update, you can now skip the tutorial in case you’re rolling alts but don’t want to sit through stuff you’re already familiar with. We’re making edits to lower levels (6 – 14) like adding rental mount vendors for low level zones and adding more runecrafting stations and lesser runes to increase player power and decrease levelling time during the early hours. We’re also adjusting ELO matching, decreasing the amount of rating you and your party loses after being defeated. We’re updating the rune system by giving the ability to unlock and reroll slots, and making some tweaks to the randomness of drops. We’re reducing dye costs as well, meaning that players will get more opportunities to utilize the dye system and customize their character. More gold will be rewarded for activities at the lower levels, giving players more currency to play with, buying new housing items, gear and other fancy doodads. Housing will also be getting a great new feature, as now players will be able to not only remodel their home but also the music that plays on their housing plots. And in addition to all the above (yes there’s more, we told you this drop was HUGE) we are improving combat balance across all classes, making revisions to ability and support powers and (drumroll please), we’re adding more client optimization tweaks meaning that you’ll see the glorious sights of Nexus in more frames per second than ever before. Also coming in this next update, there are plenty of big fixes for issues that fans have been asking for. We’re doing some major housecleaning to areas like UI, balancing, game performance, tradeskills, housing, adventures and much more. Bugs tied to items, like the Protection item special that used to break a Stalker out of Stealth, are being patched. Bugs from boss fights are also being fixed, so the Vulcarrion Healer in the Scorchwing World Boss fight will now properly decrement Interrupt Armor when interrupts are used, for example. Some players felt the world was too big to travel around quickly, so we’re making a few adjustments there as well. In addition to the rental mount vendors mentioned earlier, Capital City Transmat spells (Transmat to Thayd and Transmat to Illium) have had their cooldown times reduced from 24 hours to 30 minutes. If you want to know everything about what’s being changed in WildStar with this next update, here is the link to the upcoming patch notes – all 100+ pages of it. These notes are our working patch notes and may differ from the final notes based on QA testing. We will post final notes on the WildStar web site in conjunction with the next content release. Unfortunately, due to time requirements, we have to put these notes out in English only for the time being. We wanted to get these out to you ASAP, so FR and DE versions will follow as soon as our hardworking localization team has finished them. All of what we’ve just covered is coming up in the next WildStar update, but there’s so much more on the horizon. As we look ahead to the end of this year and into the next, we have even more exciting plans to share. Some of these you’ll be hearing about in our next State of the Game update in the coming weeks. Just like you’ve shown your dedication to WildStar, we’re in it for the long haul too. Together, we will continue working tirelessly to make this the best experience for our fans and make Nexus your home for years to come.